You’ve all heard it before. How do you get to Carnegie Hall? Practice, practice, practice. We took the easier route with the tour December 1, 2014. Unfortunately, I wasn’t posting much in this blog yet so I don’t remember everything that happened. I do highly recommend the tour if you’re in New York City. 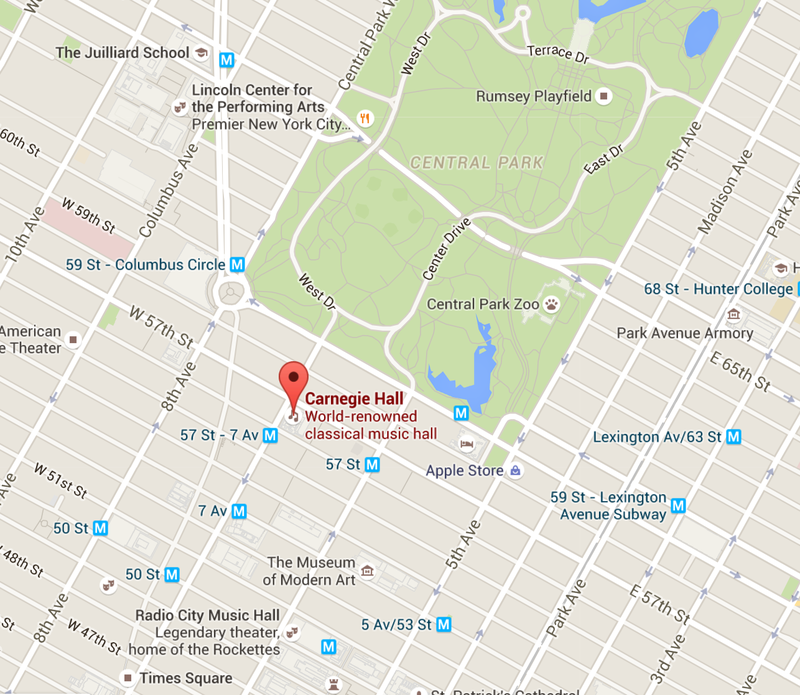 If you want to go, other than practicing, Carnegie Hall is a concert venue in Midtown Manhattan located at 881 Seventh Avenue, occupying the east stretch of Seventh Avenue between West 56th Street and West 57th Street, two blocks south of Central Park. NEW YORK (AP) _ For nine years, the people who run Carnegie Hall insisted there was nothing wrong with the acoustics at the famed concert hall. This summer, a layer of concrete, apparently left over from a major renovation job in 1986, was discovered under the stage. The concrete was ripped out and a new floor was installed that administrators say should improve acoustics. Since the renovation, musicians and critics have complained about the acoustics, saying the sound the hall was world famous for wasn’t the same, that the bass had become washed out and the higher instruments harsh. Executive Director Judith Arron said Wednesday she had been assured there was no concrete under the stage since arriving at the hall in 1986. But the tongue-in-groove maple stage floor, which usually lasts 20 years, had warped so badly after just nine years, it was difficult to push a piano across it. She speculated the concrete was added to reinforce the stage while scaffolding was on it during the 1986 renovation and then simply left there in workers’ haste to finish. The concrete had been placed under two layers of plywood, on which the maple stage floor rests. Nomikos said the floor is now constructed the way it was from Carnegie Hall’s opening in 1891 until 1986. The new floor will meet its first test Sept. 26, when the Philadelphia Orchestra plays. The hall’s official gala opening for its 105th season will be Oct. 5 by the Boston Symphony. Plaque on Steinwall Hall (old building). This was just after Michael and I played there. Plaque on Steinwall Hall (old building). There were many, many pictures on the walls of people who had performed there. All in all, a fantastic tour. Take it if you’re in NYC! Andrew Carnegie’s new Music Hall opened with a five-day music festival beginning on May 5. Guest of honor Pyotr Ilyich Tchaikovsky conducted his Marche Solennelle on Opening Night and his Piano Concerto No. 1 several days later. William Tuthill’s design reflects Gilded Age architectural tastes and engineering. Since the Hall was built shortly before the advent of structural steel construction, its walls are made of fairly heavy brick and masonry, to carry the full load of the structure without the lighter support that a steel framework soon made possible. The Italian Renaissance design of the exterior reflects the eclectic architectural tastes of the period, which look to European models of earlier centuries for inspiration. Tuthill deliberately chose to keep the styling and decorative elements simple, elegant, and functional, focusing his energies on designing an excellent acoustic environment. I came across this interesting 1947 movie about Carnegie Hall for my Music Studio Blog and I’m posting it here, as well. A mother (Marsha Hunt) wants her son (William Prince) to grow up to be a pianist good enough to play at Carnegie Hall but, when grown, the son prefers to play with Vaughan Monroe’s orchestra. But Mama’s wishes prevail and the son appears at Carnegie Hall as the composer-conductor-pianist of a modern horn concerto, with Harry James as the soloist. Frank McHugh is along as a Carnegie Hall porter and doorman, and Martha O’Driscoll is a singer who provides the love interest for Prince. Meanwhile and between while a brigade of classical music names from the 1940’s (and earlier and later) appear; the conductors Walter Damrosch, Bruno Walter, Artur Rodzinski, Fritz Reiner and Leopold Stokowski; singers Rise Stevens, Lily Pons, Jan Peerce and Ezio Pinza, plus pianist Arthur Rubinstein, cellist Gregor Piatigorsky and violinist Jascha Heifetz. We checked out pretty early from the Airbnb. Neither of the hosts were there so we left the key on the counter and took our luggage over to Michael’s. Fortunately, the new Steinway Hall, when completed, will have built-in professional recording. That Steinway Hall (on 57th Street) was designated a registered historic and cultural landmark in 2001. The exterior featured a bas-relief of Apollo and a musical muse by Leo Lentelli located in the lunette above the grand window at ground level. The main room, a two-story rotunda, featured high domed ceilings, handpainted by Paul Arndt. The interior design was appointed with marble and portraits of composers and concert artists. Some valuable paintings are showcased throughout Steinway Hall, by such renowned artists as Rockwell Kent, N.C. Wyeth, Leopold Seyffert and Charles Chambers. The main rotunda seated up to 300 guests and a small symphony orchestra. The showrooms were covered with wood panels for better acoustics. In the basement of Steinway Hall was a concert grand piano bank: an exclusive collection of Steinway concert grand pianos, maintained for the use in live concerts as well as for studio recordings by performing artists. At the end of June 2013 Steinway & Sons announced that they sold the leasehold interest in the Steinway Hall on 57th Street for $46.3 million in cash. The current, interim location is a rented building on the address 1133 Avenue of the Americas. We got to our location faster than expected and walked around the block. I was stunned when we saw Cafe Un Deux Trois! Cafe Un Deux Trois has a special memory for me. November 2, 2003, Michael decided to run the New York Marathon. We went to NY to see him run. (He finished in 4:21:57. The average for males that year was 4:28:56). The New York City Marathon (branded TCS New York City Marathon and formerly branded ING New York City Marathon for sponsorship reasons) is an annual marathon (42.195 km or 26.219 mi) that courses through the five boroughs of New York City. It is the largest marathon in the world, with 50,304 finishers in 2013. Along with the Boston Marathon and Chicago Marathon, it is among the pre-eminent long-distance annual running events in the United States and is one of the World Marathon Majors. My best friend, Alice, and her brother (David) were living in Brooklyn and they decided to meet us in Manhattan on Saturday night. Michael and a friend went to a comedy show while Alice, David, Tom and I walked around Times Square, just talking. We turned down a side street and saw… Cafe Un Deux Trois. We decided to go in to eat. I remember nothing about the meal. But, at the next table was Ben Gazzara, Gena Rowlands, Peter Bogdanovitch and 3-4 others I didn’t recognize. After about half an hour, Carol Kane came in, too. It turned out that Ben Gazzara was in a one man show across the street which had just opened: Nobody Don’t Like Yogi. All this made the meal very exciting. For the last several years, every time we’ve been near Times Square, I’ve looked down the side streets for this restaurant and never saw it again until this day. A very nice memory of Alice. When we got back to Steinway Hall, the doors were opened and we went up to the recital room. A friend of Tom’s came to listen, too. After Steinway Hall, we went to Tony’s di Napoli for lunch, Then rested for a bit at Michael’s. Then we picked up our stuff at Michael’s, took the subway to Penn Station and headed home, exhausted.